This post is from Justin Martin, the awesome artist behind Dink Smallwood and the new Dink port we’re doing for iPhone! He’ll be using codedojo from time to time as well. Just check the name near the top to see if it’s Seth or Justin who is posting. After five+ years of adventuring in the land of Azeroth, I discovered yesterday that my beloved WoW toons were hacked… some deleted and all others stripped of everything–all my precious epics sold or sharded and gold stolen. 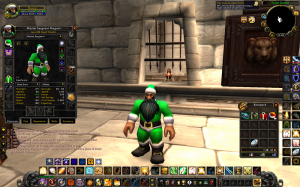 Maguro, my level 80 pally, was left wearing his seasonal xmas garb. The mockery… the nerve… my gearscore went from about 4850 to 70 in a whim in contrast to the many months/years spent in acquiring rare drops. Damn f*** gold farmer hackers. Damn Blizz for not being speedy with replies. The new year also brings good tidings. I’m excited about developing art work/interface graphics for the upcoming Dink Smallwood port to the iPhone/iPod. I had lived and breathed Dink Smallwood (DS) during it’s year and a half development and look forward to revisiting Dink and working with Seth to make the gui as polished and intuitive as possible. Thanks to all you Dinkers for keeping DS alive and well. Looking forward to some fun duck stomping on my iPod. This entry was posted in Art, Dink Smallwood, Life on January 5, 2010 by Justin. Yeah, most of alliance are noobtards. But hey I wanted a paladin at the time and had to make unforeseen sacrifices. Can’t you make a couple of new NPC graphics for the new Dink Smallwood version (The iphone one) and use them in the game to minimize re-use. Of course it also would be nice if we dmod developers also could use them. My schedule has been a real juggling act lately… my main goal right now is to complete vital, outstanding graphic components for Dink’s imminent release. I have thought about the idea of generating a new sprite or two for the ported games, but like I said, my current main focus is to create the key interface graphics, and if I’m lucky to have the luxury of “extra” time, then I may consider pursuing other additions–although, the likelihood of that happening could be slim since we’re really trying to push the game out into the hands of our players as soon as possible. Ok, I agree that that’s most important. When do you think it will be out? It would be awesome to get it sometime during summer!